Would you like fries with that Secret Service detail? 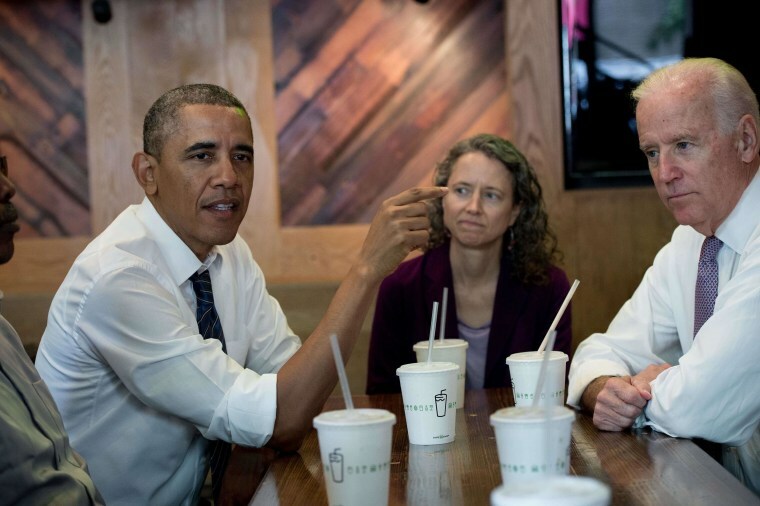 President Barack Obama and Vice President Joe Biden joined four local workers Friday to chow down on burgers at Shake Shack in Washington, D.C. The president had a burger and fries, according to a Biden aide, while the VP ordered a cheeseburger, French fries and a black-and-white milkshake. The POTUS chose the Dupont Circle burger joint, he said, because it has “great burgers and pays its employees more than 10 bucks an hour,” according to a pool reporter present. The White House has been pushing Congress to raise the federal minimum wage. And the administration has also recently focused on the need for legislative action to keep money flowing to highway and infrastructure projects nationwide. To promote that latter effort, the president and vice president were joined at lunch by four construction workers involved in a recent $9.1 million reconstruction project – which included almost $7 million in federal aid. “If Congress does not act by the end of the summer we could have hundreds of projects like this stop,” the president told reporters. "It is a no brainier for Congress to do what it is supposed to do."